Details of the new analytics feature were first posted on Instagram scheduling tool Later.com’s blog – the same site that first unveiled photos of the forthcoming business profiles, as it turns out. Note, however, that these screenshots were snapped ahead of the user interface revamp that turned Instagram’s interface from blue-and-white to black-and-white. That means when this feature launches more broadly, it will have a different visual appearance, though the content being tracked will not likely change. 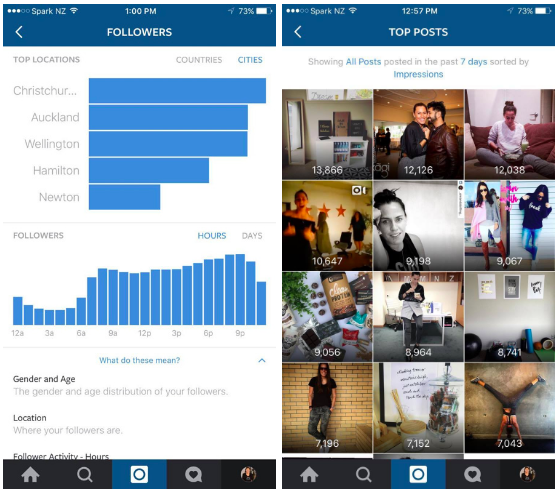 According to what’s shown in the screenshots, Instagram’s analytics offering will be called “Insights,” and will be focused on two main areas: follower demographics and post analytics. 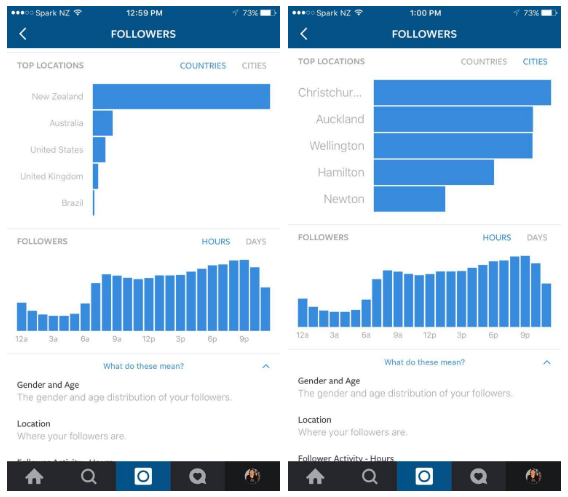 The follower analytics section offers demographic details about your audience, including followers’ location, age, and gender. Location information is available by country or by city, which makes it useful to bigger brands all the way down to smaller, local businesses. 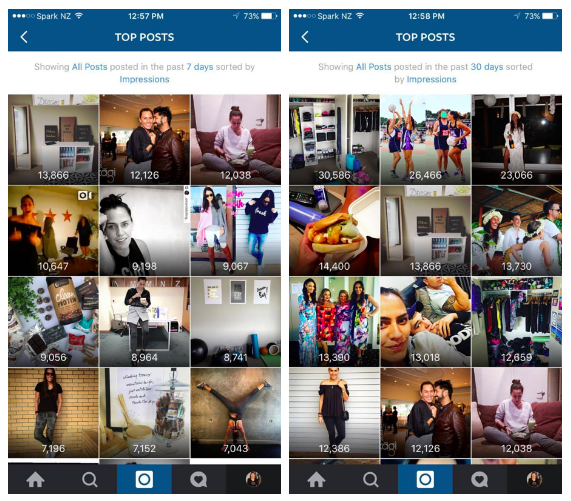 Knowing where the majority of users are based can also help businesses better determine when to post content – though to some extent, Instagram’s new algorithmic-based timeline will disrupt that flow by personalizing the feed to each user, rather than presenting posts chronologically. This updated timeline is still rolling out, Instagram told us a few days ago, though a number of users are already seeing it live in their app, we’re hearing. In addition to seeing details like gender and age, graphed out as a circle graph and bar chart, respectively, the follower analytics’ section also lets you track how many new followers you’ve gained on an hourly and daily basis. This can better help pinpoint which posts worked to convert users to followers, or which posts may have spread virally, for example. Meanwhile, the post analytics section focuses on just your Instagram content and how it’s performing. As you may expect, this lets you track data on things like impressions, reach, website clicks, and other follower activity. Impressions refers to the total number of times your posts have been seen, while reach shows you the number of unique accounts that have seen any of your posts. Website clicks lets you track how many people click the link in your profile, which business often use to link to their website. The “Follower Activity” area here also helps businesses and brands better time their posts, as it displays the most popular times of the day when your followers are using Instagram. Another module in this section lets you see your top posts sorted by impressions for either the past week or month. This area is especially interesting because it’s not a simple chart, but rather presented as a grid of image thumbnails with the number of impressions that post received is overlaid on top. This not only helps you to track which posts did well, but by viewing them all as images, you’re able to better visualize the content that works best for your audience. This can also help you track how your posts perform over time – that is, do followers and others go back and surface older posts, or do they only click on new content? We already knew that Instagram was developing an analytics tool as well as business profiles, thanks to previous reports, but we hadn’t yet seen Instagram’s analytics in action, or what sort of tracking would be available. Analytics’ public launch, expected in a few months, will see Instagram moving closer to Facebook in terms of what sort of features are made available to businesses and advertisers. The company has more recently been increasing its efforts around advertising in particular, with things like video view counts and support for longer, 60-second videos, for example. These features have been aimed at attracting TV ad dollars to the platform, which now hosts some 400 million users, as advertisers make the shift to digital. However, where Instagram had fallen short was on helping businesses – in other words, its potential advertisers – maintain a more official presence on the app by letting them share business information on profiles, or use tools that let them understand their audience, content, reach and growth. That will change in the near future, however.